This article provides details for the proper workflow when using Credit Cards and or Charge Card Accounts between Intacct and Bill.com. This article will cover the proper setup of a Charge Card account in Intacct, and will show the step by step process of creating and paying a bill using the Charge Card account. 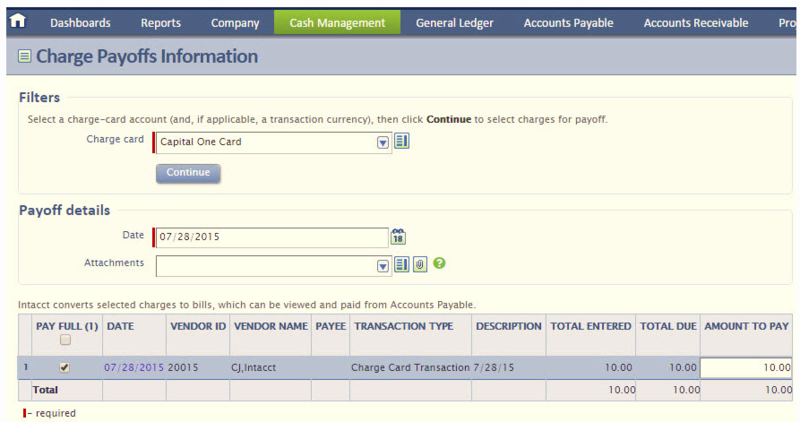 Once a sync is performed, the bill and payment will show in Intacct. A balance will show up on the AP Ledger for the Credit Card Vendor. Charge Payoffs is where liability from Credit Cards are recorded. Creating a bill for the credit card vendor from here. A bill is now created and will sync to Bill.com for payment.